The brief demanded to develop a floor plate with two divisions. One would be an SEZ, the other a non SEZ. The requirement was to develop a spacious workspace with larger number of interactive spaces as well as enclosed personal offices. The ambience was to be of a futuristic flexible working envelope with majorly white surfaces. The purpose was to create areas to receive the company graphics. The design challenge was therefore to set up a tailor-made design and construction process, which would meet the facility bifurcation requirements between the two parts of the floor. It began with an exhaustive process of research and analysis to map out the opportunities and challenges posed by the existing building envelope as well as the emotional and practical requirements of the users. Multiple layout formats were made with permutations and combinations of various workstation shapes and sizes so as to optimize the occupancy while giving unique spacious individual work stations.While the individual workspaces needed to be functional and more neutral, community areas had to offer strong visual and more aesthetically enjoyable and de stressing qualities to stimulate creativity and collaborative work. A broad participatory design methodology was followed with Comverse where multiple layout options were made and extensive discussions ensued where all aspects were reviewed and finalized with mutual consent. All office enclosures are constructed using a glass partition system, which maintains transparency and optimizes daylight while reducing noise and achieving the required degree of privacy for working teams. The open office was designed in lighter colours with low height partitions to increase the sense of spaciousness. References were taken from multiple Comverse International offices worldwide, like Paris and Bulgaria, so as to incorporate the standard design features. At Comverse the users need to be connected to their other offices within India and other parts of the world. Hence even small four seated meeting rooms and open meeting spaces were fitted with video-conferencing equipment. 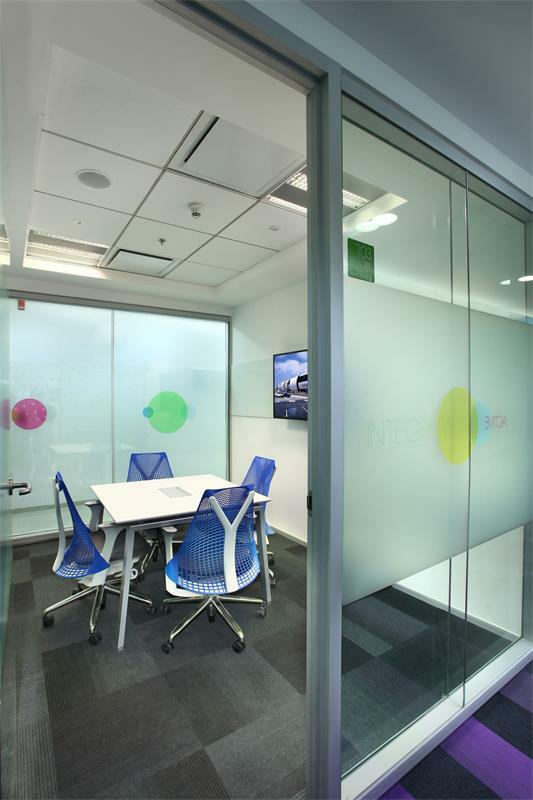 Apart from the standard meeting rooms, there are also many informal meeting areas, which have a more relaxed atmosphere for teams to have collaborative discussion. While collaborative work was encouraged; quiet rooms were provided for single users for private focused work. These smaller enclosures were carved out of corner spaces and put to effective use. The outcome was all in all a very efficient, flexible and budget friendly work envelope.